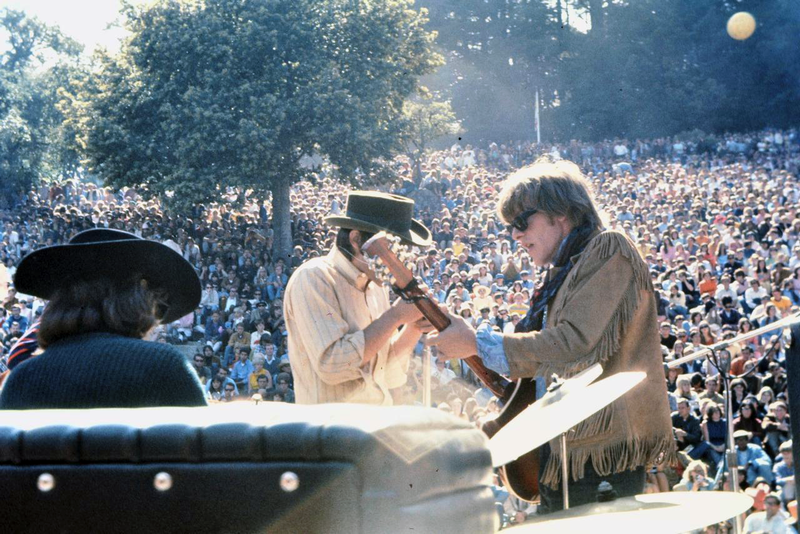 They started the 50th anniversary of the Summer of Love in San Francisco’s Golden Gate Park at the 40th anniversary. This week we head up the road to 1967 and San Francisco, to commemorate the 50th anniversary of the Summer of Love, when Jefferson Airplane, Country Joe and the Fish, Quicksilver Messenger Service, Janis Joplin and Big Brother, and the Grateful Dead rocked the known world, which was, until then, uptight, far from outta sight. The closest I personally got to the Summer of Love was climbing the non-climbable fence outside the Chico State football stadium with my best friend Chris McConnell, trying to get high enough to hear, even if we still couldn’t see, the Grateful Dead play Pioneer Week. Later Jerry Garcia and the rest of the early New Riders of the Purple Sage rocked the Hangtown Dance out at the fairgrounds, with a shockingly small audience. Can you imagine, practically having the dance floor all to yourself? We’d get used to that. The Dead and its various incarnations played podunk towns all through the valley for years and years, giving even hopelessly uncool country kids at least the dream of being hip. And boy, were we grateful. According to the Dead’s Bob Weir, the hip Haight-Ashbury scene was actually over by 1967’s Summer of Love. Appreciated for its old houses and low rents, the area was a San Francisco State student ghetto also ideal for artists, writers, and musicians, characterized by an openness to new ideas and an all-American sense of endless possibility. “It was a really fun place,” Weir told Goldmine magazine in 2011. But then intense, generally clueless media coverage turned the city’s Haight-Ashbury into a zoo. The Haight renaissance suddenly ended, according to Weir, when reporters and film crews arrived to spin tales of free love and drugs—not really what it was all about, after all—thereby attracting speed freaks, serious drug addicts, thugs, and every other loose nut from all over the country. The Dead migrated across the Golden Gate to Marin County as soon as they could manage it, carrying with them lasting aspects of the counterculture. But this summer, even Bob Weir probably won’t mind if we all pretend that the Summer of Love really was. So break out the tie-dyed T-shirts, flowy dance skirts, and heart-shaped granny glasses, put some flowers in your hair, and get up the road to San Francisco—freak flag flying! Jerry Garcia slept here at the Grateful Dead House in Haight-Ashbury, a private residence where deadheads still stop by to pay homage and leave incense, flowers, and beads. You can take the trip anyway you want. Consider a ride on the Magic Bus, a psychedelic history tour complete with 3D glasses that even points out remnants of earlier Beat culture in North Beach. Poke into Vesuvio and Tosca, cafes where On the Road author Jack Kerouac regularly drank himself into a stupor, and poet Lawrence Ferlinghetti’s City Lights bookstore, still a literary hotspot. 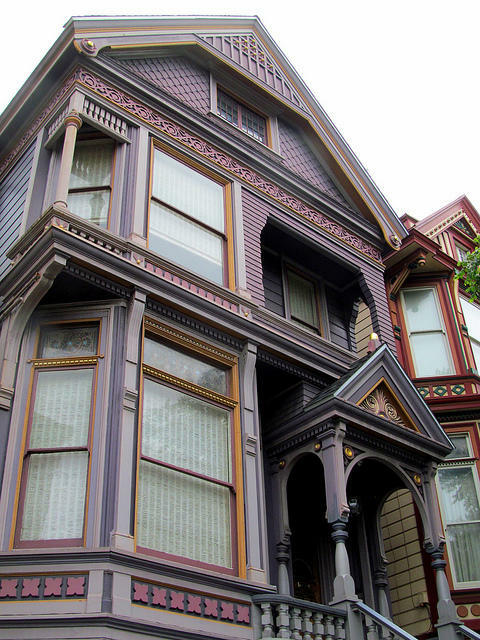 Back in the Haight you’ll see a few historic sights—including The Red Victorian, once a crash-pad, later a bed and breakfast, and now an intentional community where you may be able to stay in hostel-style accommodations, by application. On a pay-what-you-want Wild SF Free Love tour, your singing guide walks you past Janis Joplin’s house and the Dead house. at 710 Ashbury, where people still leave tributes to freeform guitarist Jerry Garcia. San Francisco Love Tours, complete with painted VW van, also give you a historic overview, or you can download the Detour app and take the Haight-Ashbury walking tour. With any luck at all there will be a big outdoor dance going on in nearby Golden Gate Park, such as the wonderful, completely free Hardly Strictly Bluegrass concert every fall. The Jerry Day concert, yes, honoring the Grateful Dead’s Jerry Garcia, takes place August 6 in McLaren Park. This year there are special Summer of Love events going on all around town, including “A Night with Janis Joplin” at the American Conservatory Theater, the rockin’ San Francisco premiere of the Broadway hit, from June 7 through July 2. The culture trip continues at local museums, such as the de Young Museum’s aesthetic immersion “The Summer of Love Experience: Art, Fashion, and Rock & Roll”; the California Historical Society’s “On the Road to the Summer of Love” counterculture exhibit of rare photos; and “Love or Confusion: Jimi Hendrix in 1967” at the Museum of the African Diaspora. Until next time, for Up the Road and North State Public Radio this is Kim Weir—no relation to the Dead’s Bob Weir, darn it, though until I read in Rolling Stone that he was adopted, I did tell people he was my cousin. How hip is that? This week we head Up the Road to appreciate the power of water. Even here in the north, where most of California’s water comes to ground, we tend to take it for granted. Turn on the kitchen or garden faucet, out it comes—and there better be enough to meet our needs, at a comfortable price. We also expect it to stay where we put it, inside the lines that represent flowing water, on maps, and behind the dams we’ve built to stop that flow, to store water and to play in it. This week we head Up the Road to celebrate the hometown parade. There’s nothing quite like it. If it’s your town, you know everyone on parade, as well as the folks lining both sides of the street. Despite that, every year it’s all new and exciting. A community on parade creates its own celebrities, not even counting the queen and her court, or the bigwigs riding upfront in the bright, shiny convertible. And not counting all the marching bands, the Boy Scout troops, the Brownies, the classic cars, the fluffy floats. And the horses! Today let’s consider journalists and snow. To hear some people talk, plain old journalism isn’t worth the paper it used to be printed on, and journalists matter even less—clearly ridiculous. Journalists do valuable work, passing along useful info, day after day. The big leaguers are more than useful, busy as they are writing one after another “first draft of history,“ a phrase used as early as 1905. What’s news today is history tomorrow, yet another truth that’s self-evident.